Get ready for Lab Week! 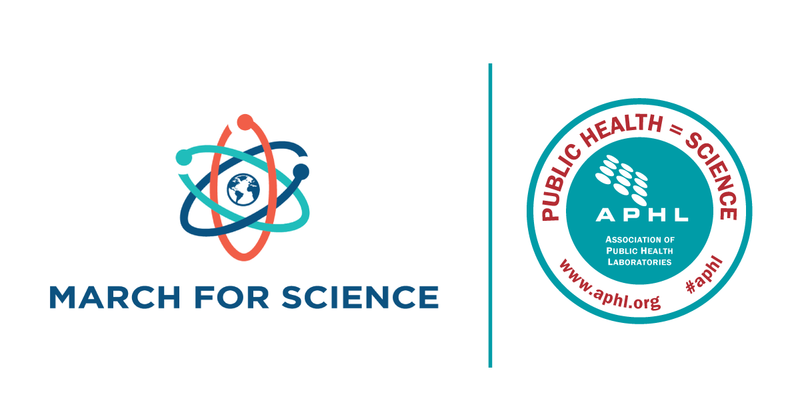 April 22-28 we will join our members and partners to celebrate the vital contributions laboratory professionals make to protect public health and safety in the US and around the globe. 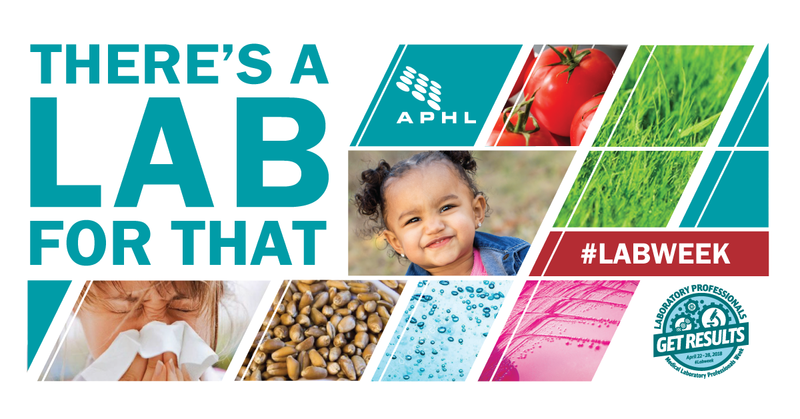 APHL will be particularly focused on the laboratory professionals who make up our community – the dedicated individuals working at local, state, environmental and agricultural laboratories which comprise the public health laboratory system. We have lots of fun things planned this year! Scroll down for printable posters, downloadable graphics and more. 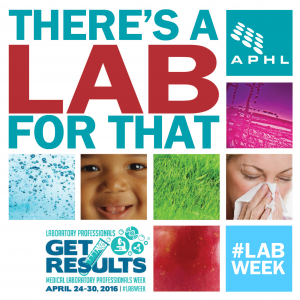 Follow APHL for our special Lab Week content (there might even be a contest on Facebook… hint hint…)! Subscribe to our podcast, Lab Culture, on iTunes, Stitcher or wherever you get your podcasts. Or find individual episodes on our blog. 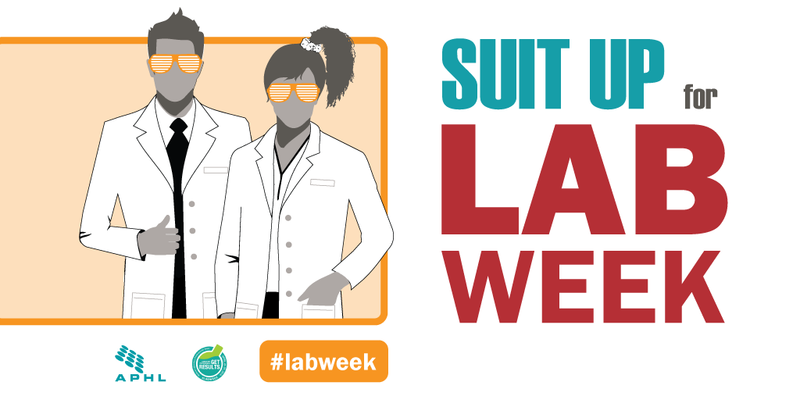 Join the conversation using #LabWeek on any social network that uses hashtags (Twitter, Facebook, Instagram, etc.). 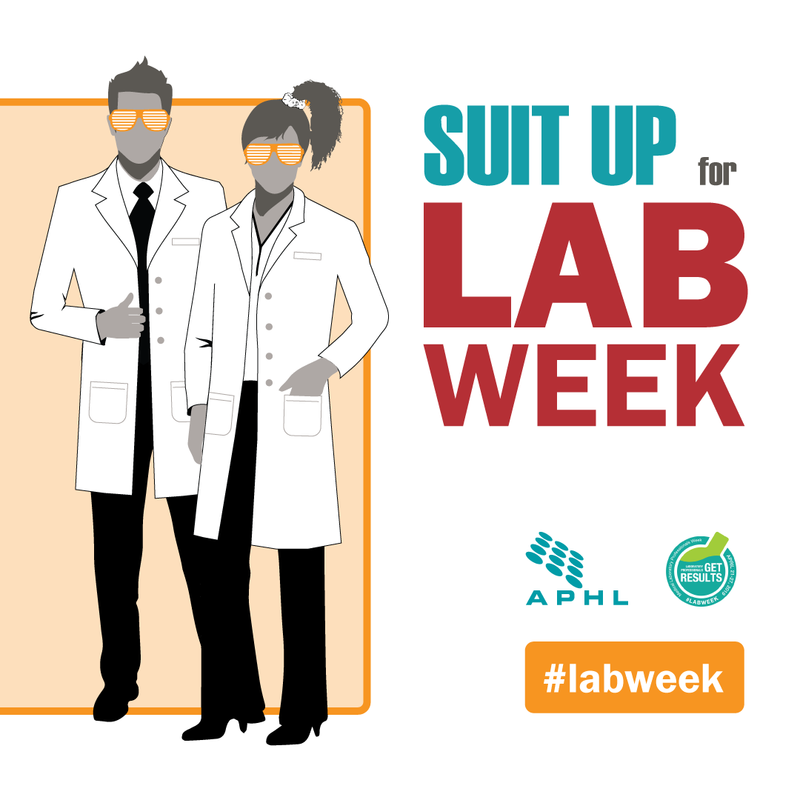 While we celebrate our members, we also use Lab Week to increase awareness and demonstrate the importance of public health and environmental laboratories in our communities. We encourage you to do the same! 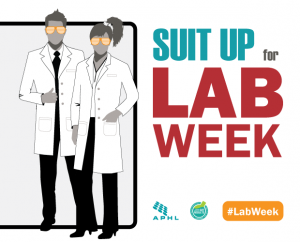 Below are some resources to help launch your own Lab Week celebration. These resources are for local, state, public health, environmental and agricultural laboratories alike! Here are two animated videos to share with your public audiences. Feel free to share the link or embed on your website. Hold an open house for media, elected officials, school groups, staff families and other members of the public. Check out the Milwaukee Health Department Laboratory’s story about their health fair for students. Visit local elementary, middle and high schools to talk with students interested in STEM disciplines. 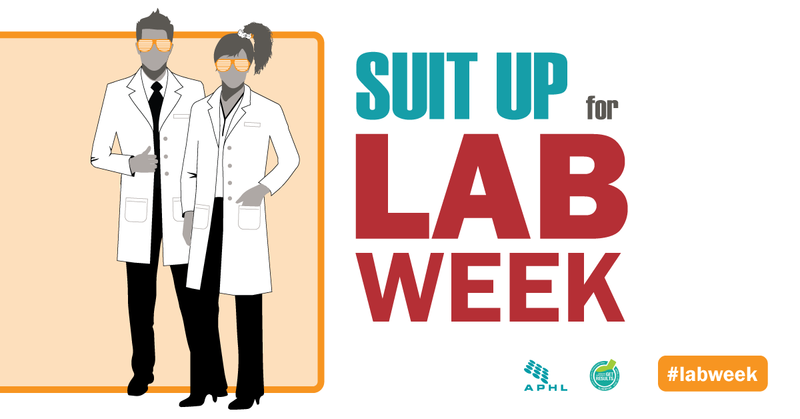 Kick off Lab Week with an Earth Day celebration and carry it through the week! Encourage employees to Travel Differently on Tuesday carpooling, taking the bus, walking or riding their bike to work. On April 26, 2018 1:00-3:00 pm ET, join Water Environment Federation (WEF) and the Association of Public Health Laboratories (APHL) for a free webcast that will introduce certified laboratory personnel to the changes found in the 2017 Method Update Rule (MUR). Updates include EPA-promulgated changes to Clean Water Act analytical test procedures for analyzing chemical, physical and biological components of wastewater and other environmental samples. If you work at a state or local public health or environmental laboratory and/or are an APHL member, please email Sarah Wright before registering to receive a code to waive the $40 fee. 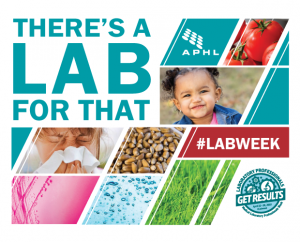 The post Everything you need for Lab Week 2018 appeared first on APHL Lab Blog. 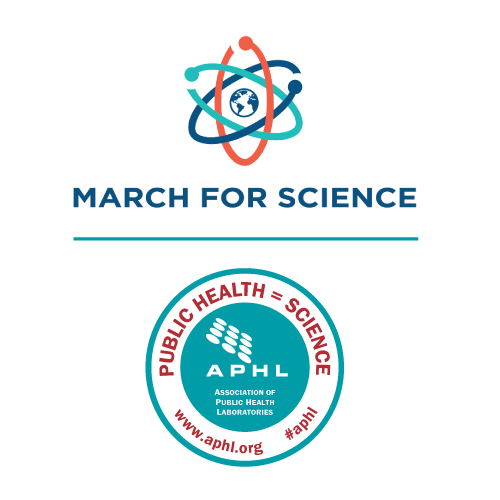 APHL is a proud partner of the March for Science! We are champions for science everyday through our work and our support of laboratory scientists around the world. Science is the root of outbreak detection, prevention and response – without science there would be no public health. 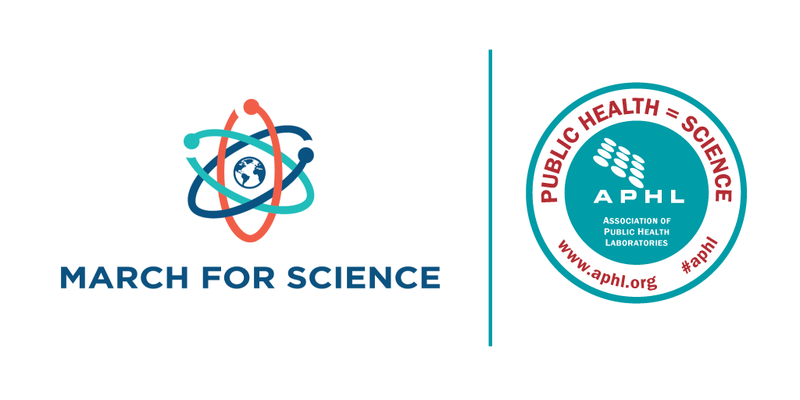 Our support is not about politics or opinions; it’s about standing with our colleagues, partners and members to strengthen the public health community by supporting science. The work we all do, whether as laboratory scientists or as support staff, is critical to protecting our communities from health threats. 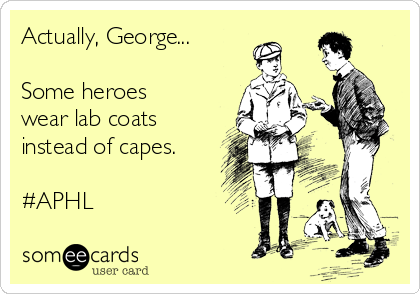 We at APHL are proud of the work that you do and we are excited to march in support of it! Whether you’re participating in the March for Science in Washington, DC, at a satellite march, or in spirit from wherever you will be, we want to hear from you! Please share your photos, videos, audio recordings or written thoughts about the March for Science and its mission. Did you know April 22 is also Earth Day? And it is the first day of Lab Week? There is so much SCIENCE to celebrate! Lab Week 2017 toolkit – There’s a Lab for That! 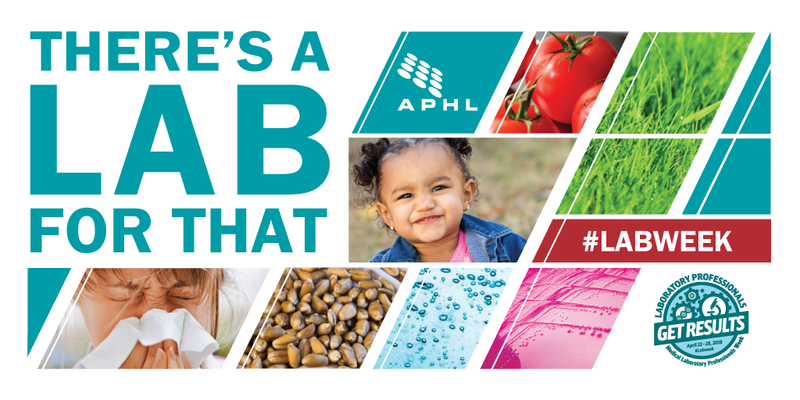 APHL will celebrate the dedicated individuals working at local, state, environmental and agricultural laboratories which comprise the public health laboratory system. How did an early desire to protect the environment lead to a public health laboratory fellowship? 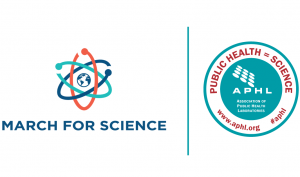 The post APHL’s March for Science Toolkit appeared first on APHL Lab Blog. Lab Week is coming! April 23-29 we will join our members and partners to celebrate the vital contributions laboratory professionals make to protect public health and safety. APHL will be particularly focused on the laboratory professionals who make up our community – the dedicated individuals working at local, state, environmental and agricultural laboratories which comprise the public health laboratory system. 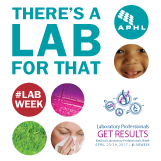 Follow APHL for our special Lab Week content! 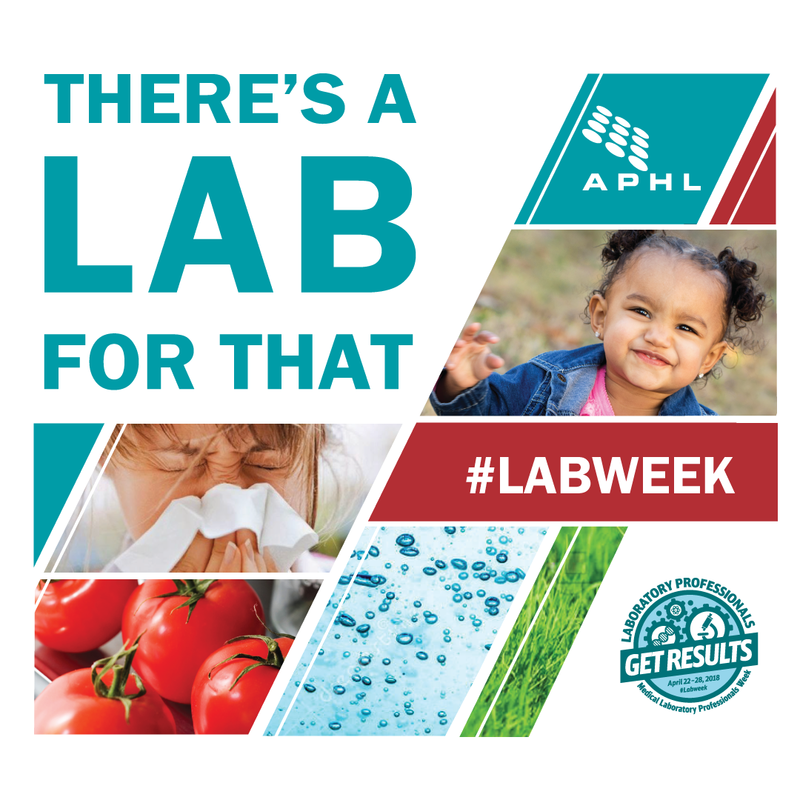 While we celebrate you, our members, we also use Lab Week to increase awareness and demonstrate the importance of public health and environmental laboratories in our communities. We encourage you to do the same! 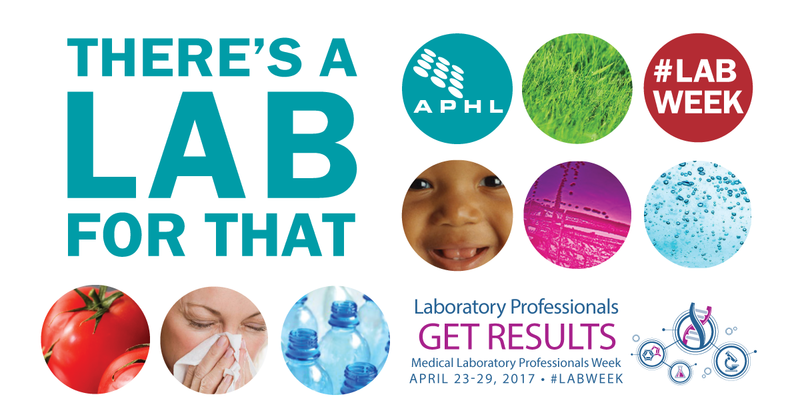 APHL will be kicking off Lab Week by joining the March for Science! Check out our toolkit! Antimicrobial resistance: What is it? Why is it a problem? What is being done to stop it? 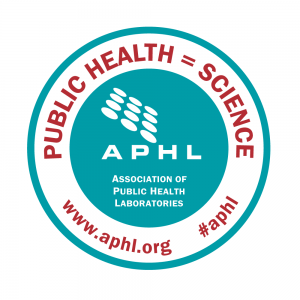 Participate in an APHL training! Get your team together during Lab Week for this webinar: Emerging and Resurging Infectious Diseases: 2017 happening April 27, 2017. And make sure to check out our other great webinars too! 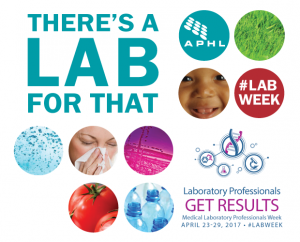 The post Everything you need for Lab Week 2017 appeared first on APHL Lab Blog. There is never a dull year in public health, but 2016 seemed particularly eventful. From Zika to the twentieth anniversary of PulseNet, APHL’s top blog posts reflect the ups and downs of the year. Even if it was tumultuous at times, we are extremely proud of the work done by our members, partners and staff to protect the public’s health and safety. You are all truly heroes in our book! 1. Sprouts: Just say no? 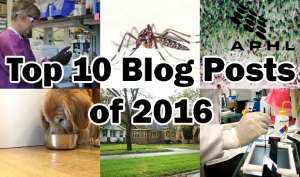 The post APHL’s top 10 blog posts of 2016 appeared first on APHL Lab Blog. 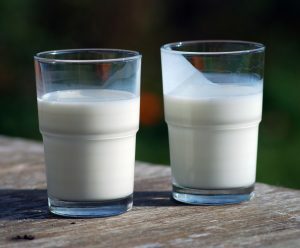 While the asserted health benefits of unpasteurized milk (aka, raw milk) have been debated, the public health community widely agrees that raw milk can carry potentially serious foodborne pathogens that are especially dangerous for high-risk groups like young children and the elderly. Based on our experiences in public health laboratory science and epidemiology, we are convinced that those risks outweigh any potential benefits. Interstate sale and shipment of raw milk is illegal in the US, however several states do allow raw milk sales within their borders. As of October 2015, the sale of raw milk for human consumption was legal in 40 states: 11 states permit the sale of raw milk in retail stores, 19 states permit raw milk sales only on farms and 10 states only allow acquisition of raw milk through cow-share agreements. In our state, the sale of raw milk is legal with a permit obtained from the Utah Department of Agriculture and Food (UDAF). Between May and November 2014, the Utah Department of Health (UDOH) noticed a dramatic increase in the number of cases with a Pulsed-Field Gel Electrophoresis (PFGE) strain rarely seen in the PulseNet Campylobacter database. Epidemiological investigations showed that over 50% of the sick people reported drinking or having contact with raw milk from a single dairy. Initial testing of raw milk at the dairy was negative for Campylobacter so the dairy was allowed to continue selling raw milk. However, UDOH continued to identify cases which prompted a press release recommending that the public not drink raw milk. I solating Campylobacter in raw milk is difficult as it is such a fastidious organism. UDOH and UDAF met with local health departments and federal partners to discuss new sampling strategies. Following this discussion, microbiologists from the Utah Public Health Laboratory joined investigators to conduct a follow-up environmental assessment at the dairy. This time, the new sampling strategy was used. Raw milk was collected, and, because Campylobacter is sensitive to pH differences, it needed to be neutralized. We were then able to test it for Campylobacter. The same PFGE strain of Campylobacter making people sick was found in the neutralized raw milk. We had a match! Because of this finding, the dairy’s raw milk permit was immediately suspended. The dairy’s raw milk permit was reinstated in October 2014 after multiple milk samples were found to have no pathogens. Shortly after, new Campylobacter cases infected with the same PFGE strain were entered into the PulseNet database and reported to UDOH. The dairy’s raw milk permit was revoked indefinitely. Since then, no cases of Campylobacter with the outbreak strain have been reported. Utah’s public health lab scientists, epidemiologists and other public health professionals were determined to identify and confirm the source of this outbreak. Thanks to close collaboration with partners, we were able to stop this large outbreak and prevent additional illnesses. This year we celebrate the 20th anniversary of PulseNet USA. Stories from highlighting PulseNet successes will be featured each month. Learn more about PulseNet from APHL and CDC. 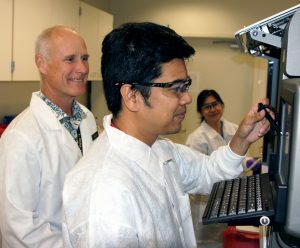 We spoke with Chris Whelen, PhD, laboratory director of the Hawaii Department of Health State Laboratories Division, about the state lab’s work and what he loves about his job. Chris is also president-elect of APHL’s Board of Directors. How did you first come to work at the Hawaii Department of Health State Laboratories Division? Right place, right time. I was approaching 20 years of active military service in the United States Army and serving at Tripler Army Medical Center in Hawaii when the Administrator position at the Hawaii Department of Health State Laboratories Division opened to external recruitment. The job appealed to me because I’ve always had an interest in population health. I was already familiar with reportable diseases and the Laboratory Response Network activities, so I was a pretty good fit, although I had a bit of a learning curve in other areas like ambient air monitoring and testing raw agricultural commodities for pesticide contamination. How does a state public health laboratory fit into the state public health system? Laboratory science is a great way to generate data to answer questions and make good, evidence-based decisions. A state public health laboratory performs testing that other labs are unwilling or unable to perform such as outbreak associated testing. For example, let’s say there’s a disease that has not presented in the community for years and therefore has had low test demand suddenly causes an explosive outbreak requiring extensive resources for several months before slipping away again. Responding to these types of situations does not fit into a commercial lab business model. Also, public health environmental labs can monitor for trends that can be identified well below the reportable contamination level, which means potential sources can be investigated, identified and eliminated before they cause harm. What is the state lab’s role? To be prepared to perform analyses that aid investigators and reassure the public. I know that may sound like a marketing sound bite, but it is true – and I really believe in it. How does your lab work with other governmental labs in the state? We work very closely with other labs – literally. We have a very nice laboratory facility, so we house the Department of Agriculture (DOA) pesticide lab and provide test support for DOA veterinary services like avian influenza and classical swine fever through our participation in the National Animal Health Laboratory Network (NAHLN). I’ve also maintained close ties with Tripler Army Medical Center, which has been mutually beneficial. How are state labs unique? What makes them different from local public health labs? All states are a little different, so I’ll just speak about Hawaii. Here, the State Laboratories Division maintains three district labs on the Neighbor Islands in direct support of Kauai, Maui and Hawaii Island District Health Officers. They perform water quality testing and some CLIA regulated clinical testing. Hawaii District Health Lab also does FDA-regulated dairy and shellfish testing. What is an example of a situation early in your time at the Hawaii Department of Health State Laboratories Division where you really felt the value of your work? In my first year at State Labs, we launched an online process to renew clinical laboratory personnel licenses, which replaced archaic, expensive and labor-intensive postcard mailing procedures. After smoothing out the bumps immediately after launch, the benefits to both us and the community were pretty obvious. Licensed personnel quickly adapted to the online renewal, and when we added online payment during the next renewal cycle, over 90% of licensees paid electronically. Over the last 10 years many things have been rewarding; from helping disease investigators in Hawaii and other Pacific Islands respond to outbreaks to preventing the importation of Salmonella tainted seafood to our supermarkets. I feel the value of the work produced by our State Laboratories on a daily basis. It gives me a rather selfish sense of pride. What’s the wildest thing that you have seen or heard of coming through your laboratory? An extremely unlikely set of circumstances led to an unusual diagnosis. We were collaborating with CDC to establish some clinical performance characteristics for a real-time PCR test for Angiostrongylus (rat lung worm) in cerebrospinal fluid (CSF) from patients with eosinophilic meningitis under an Institutional Review Board (IRB) approved protocol. Colleagues at Kaiser Permanente were assisting by providing de-identified specimens and some clinical information. Another internal effort was using excess CSF from syphilis serology requests to evaluate test performance. Unexpectedly, one of those specimens repeatedly tested positive for Angiostrogylus DNA. As luck would have it, the original request for syphilis serology came from Kaiser. Because we had an approved protocol, I was able to ask the chief pathologist/ lab director to review the chart for suspicion of rat lung worm disease. The infectious disease consultant on the case called 30 minutes later verifying the clinical suspicion and relieved to have information on a potential diagnosis because, “we were testing for everything available;” thus the CSF syphilis serology. Additional testing at CDC confirmed our detection of Angiostrogylus DNA. That was a pretty good catch. What is something you think most people don’t know about state public health laboratories? That they exist. It is a constant battle trying to raise community awareness of the terrific work that occurs in public health labs, and whenever I get an interested individual or audience, they are amazed. A lot of my job involves trying to recruit new members of the Hawaii State Labs Fan Club. 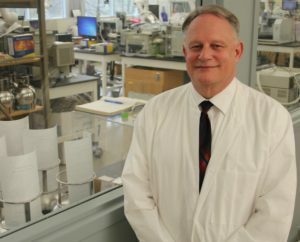 We talked with Michael Wichman, PhD, environmental laboratory director at the State Hygienic Laboratory at the University of Iowa, about what makes environmental labs unique. Learn more about environmental laboratories on APHL’s website and blog. How did you first come to work at the State Hygienic Laboratory at the University of Iowa? That was nearly 29 years ago. I was working in Cincinnati, Ohio at the time as a research chemist at a small inorganic pigment manufacturing company, and I saw an ad posted in the February 1, 1987 edition of the Kansas City Star for a chemist at the University Hygienic Laboratory (later renamed the State Hygienic Laboratory (SHL)). I still have a copy of the original ad. I grew up in Iowa, almost attended the University of Iowa and followed Iowa State and University of Iowa sports. I was also a Kansas City Royals and Chiefs fan which is why I was subscribed to the Kansas City Star. Returning to Iowa to be closer to my family for a position with the University of Iowa was quite appealing. (Note, my family also noticed the same ad in the Council Bluffs, Iowa and Omaha, Nebraska newspapers. They sent the ad to me via U.S. Mail — 1987 was way before email.) I submitted a typed (anyone remember typewriters?) application letter and resume on February 19th to the laboratory, had a telephone interview on Good Friday, an in-person interview the Monday after Mother’s Day and started my position at the laboratory that July. How does an environmental health lab fit into the state public health system? What is the environmental lab’s role? Environmental health is public health. One could argue that the origins of public health were founded in response to environmental issues. Testing performed by the state environmental health laboratory is a valuable source of objective information to determine the effect of environmental exposures on human and animal health. This can range from determination of asbestos, metals, nutrients, environmental and blood lead, as well as numerous organic compounds such as pesticides and polycyclic aromatic hydrocarbons (PAHs). These analytical services may support local, state and federal compliance monitoring requirements (Safe Drinking Water Act, Clean Air Act, Clean Water Act, etc. ), as well as local or state monitoring programs such as monitoring rivers, lakes and ambient air. That’s just a portion of their work. Many state labs play an essential role in local, state and national environmental emergency response programs. Labs test various matrices (water, soil, food and plants) in response to chemical threat incidents, radiological exposure, contaminants in the food supply or water emergencies due to instances such as flooding or chemical spills. Unbiased, quality data allows government officials to remediate the emergency situation accordingly, protecting the public. How are environmental labs unique? What makes them different from other types of PHLs? Environmental laboratories are required to maintain a variety of certifications and accreditations for their various testing services, but these can vary vastly between states. Labs may need to be accredited by either the state, EPA or the National Environmental Laboratory Accreditation Program (NELAP). Additional accreditations may be required for asbestos, lead and industrial hygiene testing. The only certification consistent across the United States is for drinking water analysis under the Safe Drinking Water Act, and the State Principal Drinking Water Laboratory (which is generally the state environmental laboratory) which is certified by the EPA Regional Office. Environmental laboratories also require unique equipment when compared to public health and clinical labs. This highly specialized instrumentation, coupled with a multitude of testing methods, allow labs to detect environmental contaminants at incredibly low levels. What is an example of a situation early in your time at the Hygienic Lab where you really felt the value of your work? Another example occurred Memorial Day weekend when the shredded tire lining at the Iowa City landfill caught fire. The smoke could be seen and smelled for many miles. SHL staff came into the laboratory that Saturday, Sunday and Monday. They deployed air samplers, collected and analyzed samples all weekend. Data was provided to local emergency management and local public health to develop and distribute public health announcements. What’s the wildest thing that you have seen or heard of coming through your lab? We have received many interesting samples over the years including a water sample in a Sioux Bee Honey® container, a tennis shoe, an actual bee hive, lead wheel weights, candy, various toys and more for testing. What is something you think most people don’t know about environmental labs? Environmental laboratories perform considerably more testing than the general public may realize and it goes well beyond drinking and wastewater. Staff at our laboratory and other environmental laboratories are incredibly dedicated and eager to provide analytical testing services to help ensure that our environment is safe.